Scotland is renowned for its rapidly changeable and unpredictable weather – but if you get caught out by the rain, it does have its advantages. Not only does it keep our ancient forests green and verdant, but the rain also powers our rivers and burns – and their waterfalls. 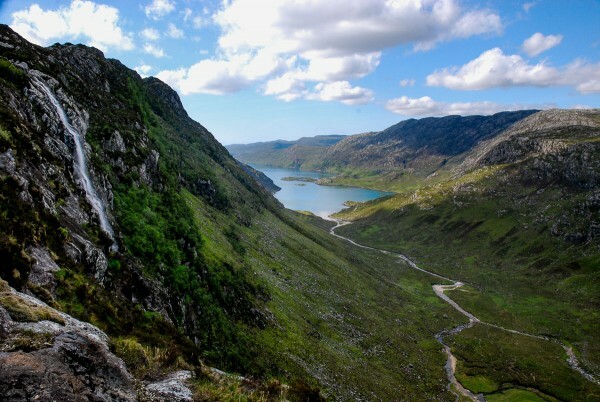 Here’s our pick of some of Scotland’s most scenic and impressive cataracts. Mighty Plodda Falls is not just one of Scotland’s most majestic falls, it is one of the most accessible too, requiring only a short walk from a parking area above Tomich, south of Glen Affric near Inverness. The falls are an impressive 151 feet (46 metres) high, and when in spate are powerful enough to soak viewers at the balcony with spray. Don’t miss the cantilevered viewing platform that juts out above the falls to give a dizzying view down. The Falls of Kirkaig make for a popular walk from picturesque Inverkirkaig Bay to the south of Lochinver, with views to Suilven along the way. 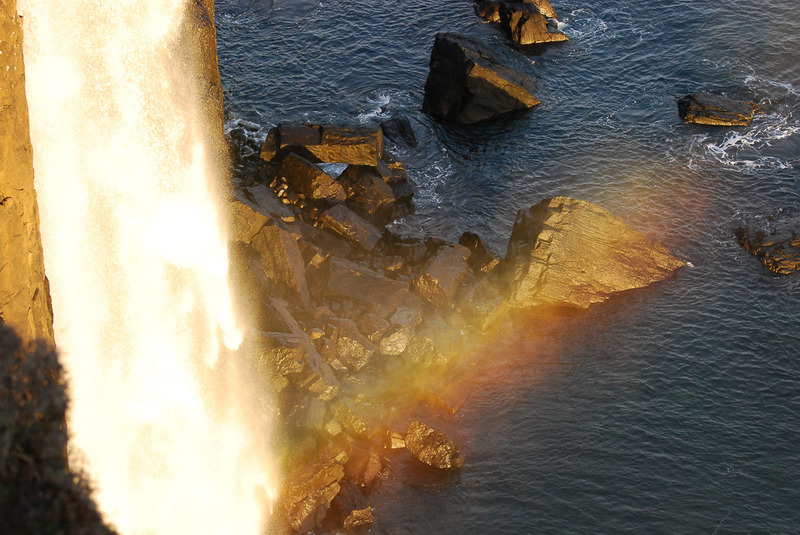 Around 20 metres high, the falls usually carry a good deal of water and make an impressive sight. The Mealt Falls are perhaps little known by name but are a familiar sight to visitors to the Isle of Skye. The falls are set directly below the viewing area for the Kilt Rock – a columnar basalt cliff – on the Trotternish peninsula, and plunge down into the sea. This is a windy spot, and in winter the falls are sometimes blown straight back up the cliffs and over the car park itself. Thousands of visitors speed along the A82 linking the iconic landscapes of Glencoe with Fort William and beyond, but few of them stop to visit the Inchree Falls, set on a forest walk. These fine cascades on the Abhainn Righ consist of a series of eight waterfalls, though only the upper few steps can be clearly seen. 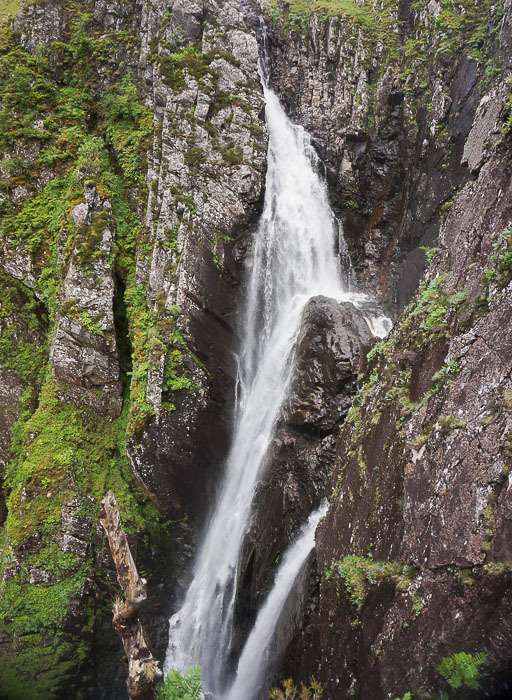 If you are a waterfall fan, be sure to visit the Grey Mare’s Tail at Kinlochleven too. 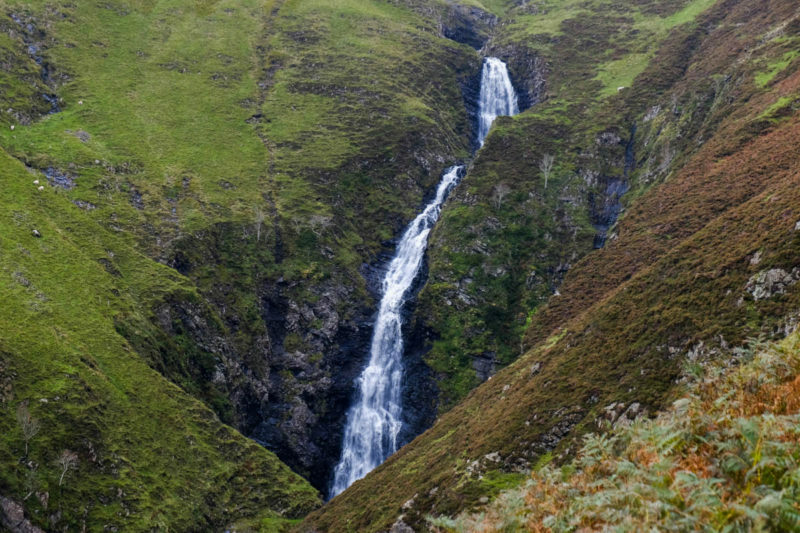 One of many waterfalls of the same name (see above), the Grey Mare’s Tail near Moffat in Dumfries and Galloway is perhaps the best known, and is the most impressive waterfall in southern Scotland. 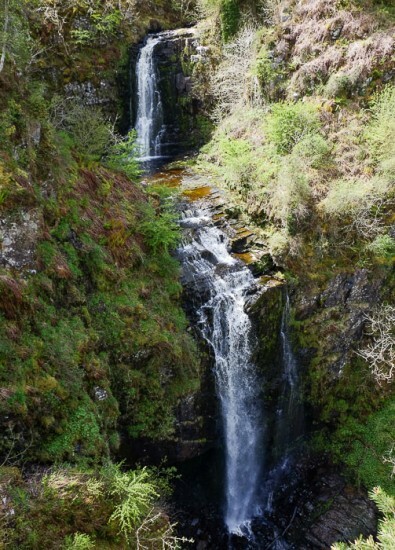 The falls are a total of 60 metres in height and were celebrated in a poem by Sir Walter Scott. 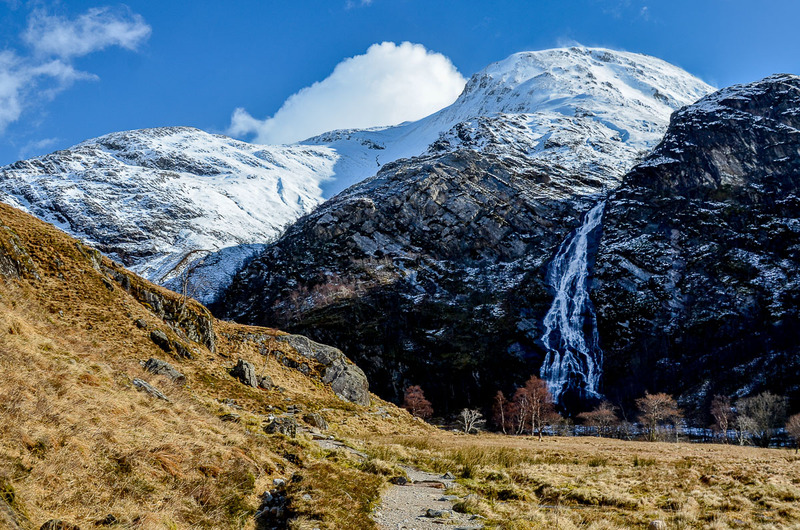 The Polldubh Falls in the middle reaches of Glen Nevis are popular and impressive enough, but they pale compared to the main event further up the glen. One of Scotland’s most beautiful walks leads through the Nevis Gorge to reveal the mighty Steall Falls, which cascade 105m down from the mountains of the Mamores. The river here is crossed by a three-wire bridge, the crossing of which makes for an adventure for many visitors. 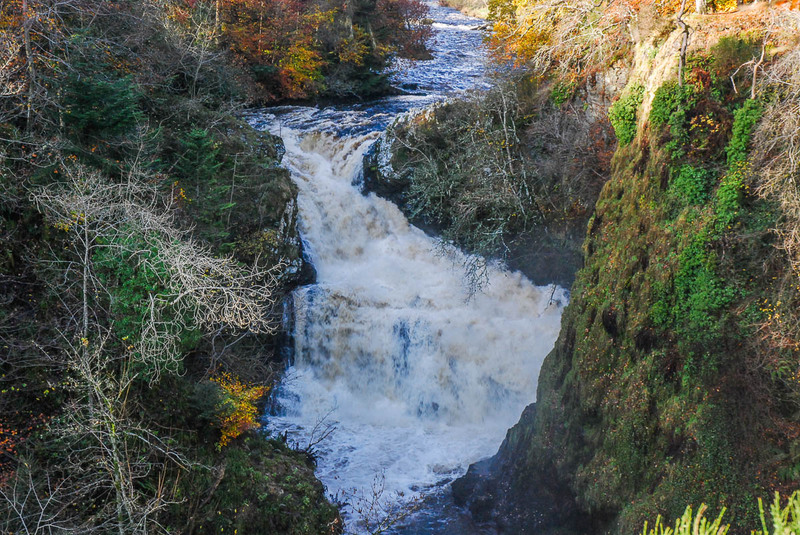 These falls consist of a double leap of 6 metres and then 18 metres, but when the Isla is in spate they merge into a single fall – and it is the great volume of water that make the Reekie Linn so impressive. The start of the idyllic walk visiting the Falls of Bruar is almost hidden away by the massive House of Bruar retail complex near Blair Atholl. The walk has been a draw for visitors for much longer though, inspiring luminaries such as Robert Burns who petitioned the Duke of Atholl to plant trees here. There are several picturesque falls along the river, spanned by some picturesque bridges, rather than one single great waterfall. Though not quite the highest, most people who have seen them rate the Falls of Glomach as the most impressive in Scotland. 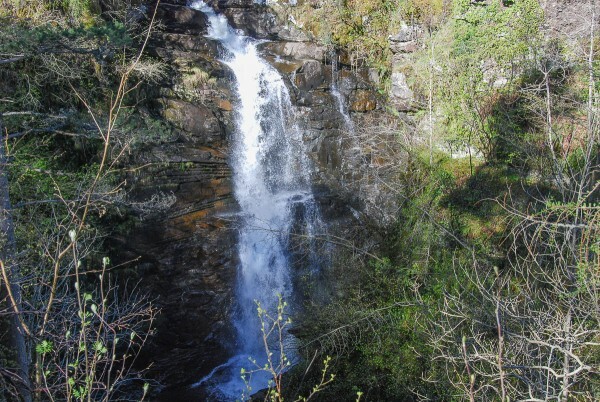 A reasonably strenuous walk reaches the vertigo-inducing path at the top of the 113 metre (370 feet) cascade from the Morvich side; a longer route heads up Glen Elchaig to the foot of the falls but requires exposed scrambling to reach the top. 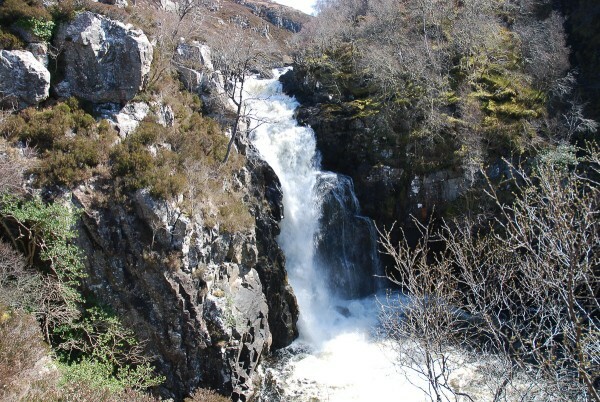 The Falls are visited on the Cape Wrath Trail backpacking route. The Linn of Ruthrie near Aberlour do not trouble the record books, but it isn’t always the highest or most powerful falls that give the most memorable experience. Sometimes the weather conditions or the quality of light can help to make a waterfall visit a magical one. 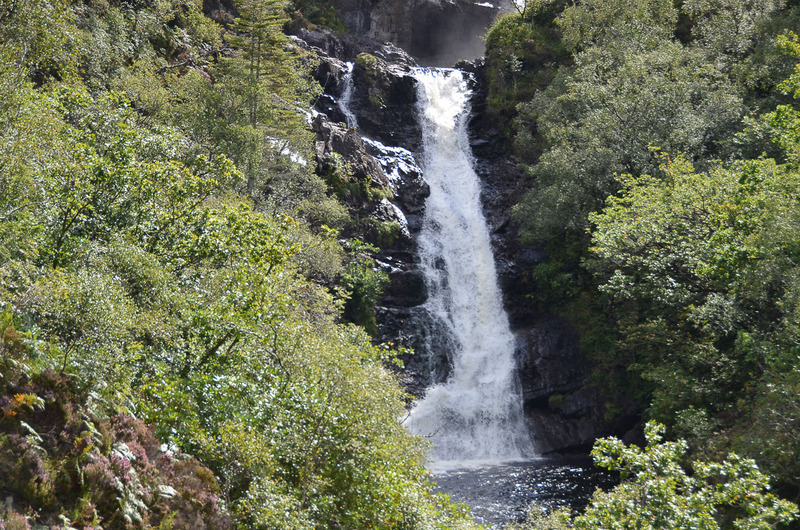 There are relatively few impressive waterfalls on the islands, but Arran actually has two great ones. The Eas Mor falls above Kildonan are well worth a visit, but it is the double leap of the Glenashdale Falls above Whiting Bay that make one of the island’s most popular walks. The falls are around 45 metres (140 feet) in total. It may be famed as Glasgow’s river, but the upper reaches of the Clyde have some great scenery. 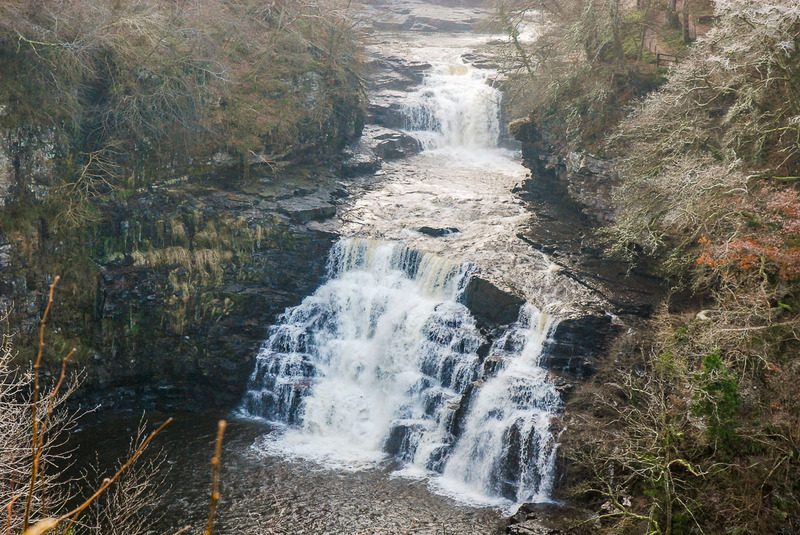 The Falls of Clyde include the upper falls of Bonnington Linn, Corra Linn, Dundaff Linn, and the lower falls of Stonebyres Linn. 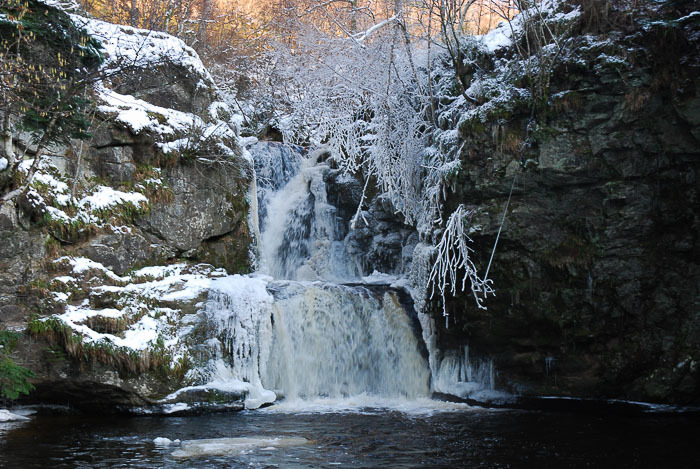 Corra Linn is the highest, a cascade of 27 metres; set close to the World Heritage Site of New Lanark, they are a popular place ot visit. 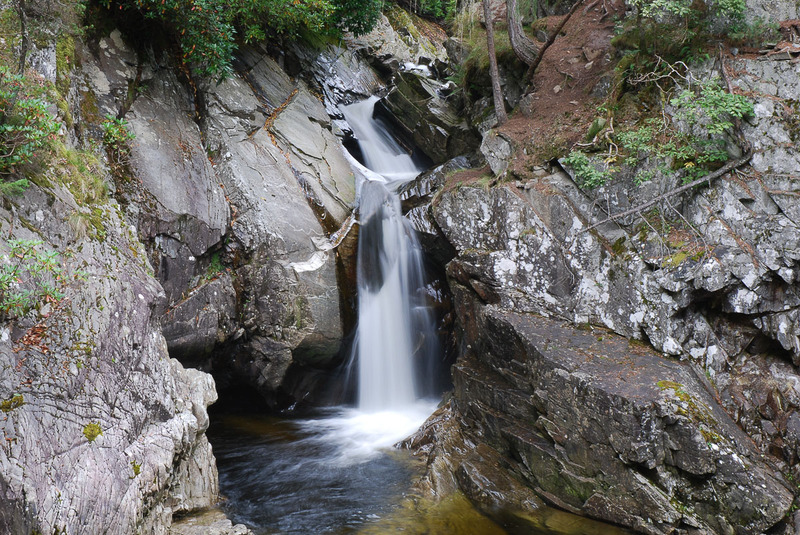 Considering they are only a short walk from Pitlochry, it is perhaps surprising that the Black Spout falls are not better known by visitors. 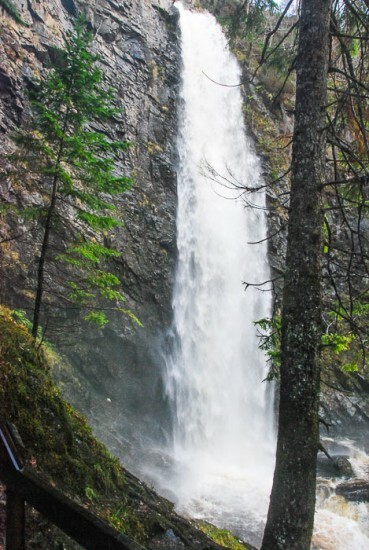 The waterfall is over sixty metres high and can look very impressive after heavy rainfall. The Eas a’ Chual Aluinn are the highest waterfalls in the UK. Most impressive in spate conditions, the falls are remote and even those used to rugged terrain may find it hard to get a good view of the whole 200m cascade. 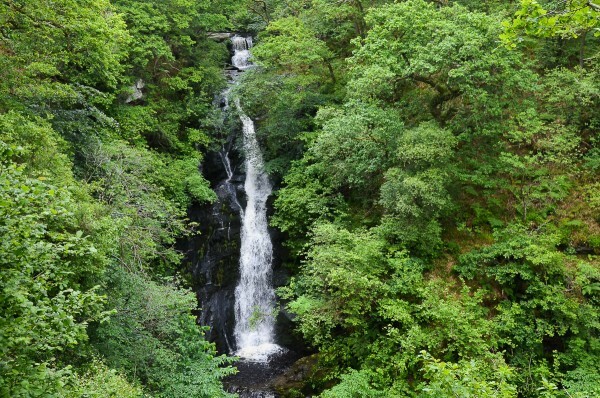 The Moness Falls – 25m high – are the climax to the idyllic walk through the Birks of Aberfeldy, and helped inspire the Robert Burns poem. The walk is a very popular excursion from the town of Aberfeldy, and there is a giddy view down from a footbridge above the falls. 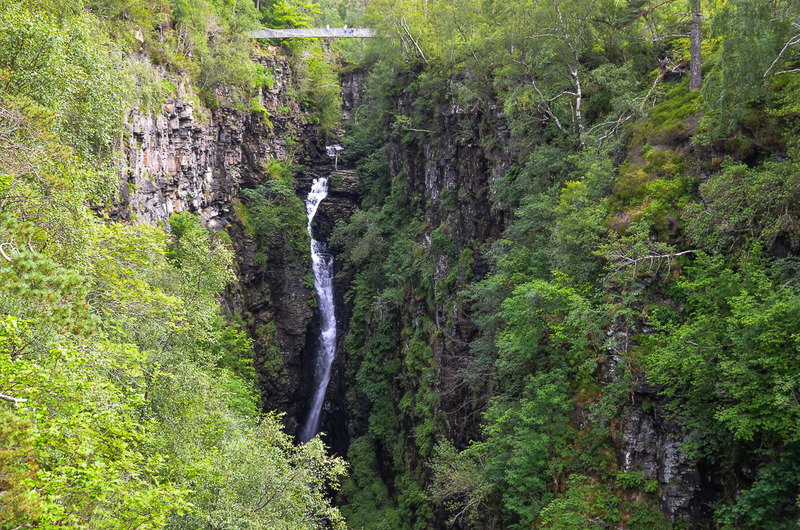 The Falls of Measach are an impressive 46m (150 feet) high, but are just one part of the attraction of the dramatic and amazingly narrow canyon of Corrieshalloch Gorge near Ullapool. A footbridge crosses high above the falls whilst a short distance down-river a cantilevered viewing platform gives an unforgettable view.